Please allow 8-13 days for shipping. 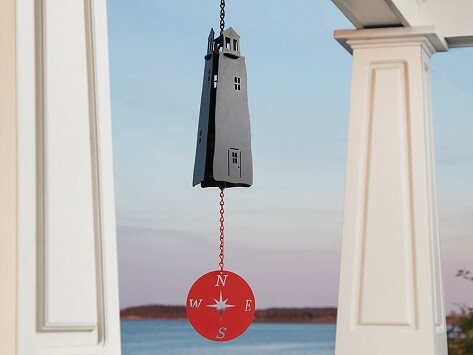 These coastal-themed bells are made in Maine from recycled steel to create a pleasant sound. They are built to last, making for a sweet addition to your outdoor space for at least 20 years. Dimensions: Beacon Lighthouse: 4" x 4" x 10"; Compass Rose: 8" x 8" x 14"; Sailor Lighthouse: 5" x 5" x 12"
Weight: Beacon Lighthouse: 2.95 lbs. ; Compass Rose: 1.9 lbs. ; Sailor Lighthouse: 4.85 lbs. Dimensions: 8" x 4.5" x 0.1"
After vacationing in Maine last summer with my son and and daughter-in-law, this was the perfect Christmas gift for them. Jim Davidson was a lobsterman in Maine for years. Buoy bells chiming as he hauled in his lobster traps was a favorite sound—equal parts peaceful and melodic, and an indicator that he was safely close to harbor. Jim was so enamored with the sound that he and his wife, May, began creating their own wind chimes to capture it. 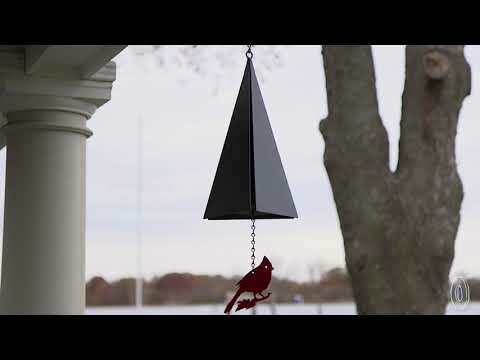 Their North Country Wind Bells are made at home in Maine and capture the tones of over 20 coastal and harbor bells. Each location has a distinctive sound—from Bar Harbor to San Francisco—that Jim and May have carefully recreated. They started by recording as many local bells as they could. They then fine-tuned their own bells by ear until the sound was just right. The bells and windcatchers are crafted from recycled steel by many of the locals in the Davidsons' small town, and should last for at least 20 years of coastal-inspired sound.